There are lots of articles these days on saving money on your grocery bill. If you’ve stretched to buy organic foods in the past, the surge in food prices may have put you at the tipping point where you consider cutting back on organic purchases. Don’t despair. 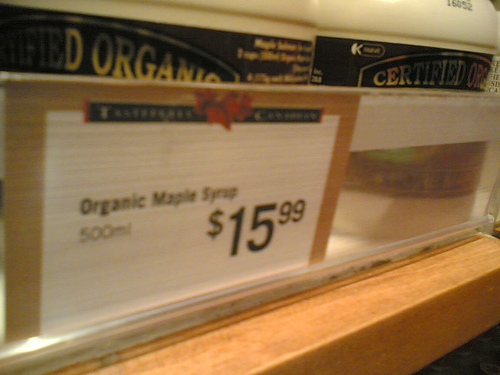 There are ways to cut back on the high price of organic too. I found a few good articles here and here detailing ways to save on organic food. To those I’ll add my own personal tricks for healthy eating on a budget. 1. Grow your own organic vegetables and fruits- focus those items most impacted by pesticides: Strawberries, spinach, celery and bell peppers are easy to grow. If have the time and space, plant potatoes or start your own orchard with: apples, cherries, grapes, nectarines, peaches, pears, and red raspberries. 2. Visit the farmers market just before closing time. Many merchants will offer organic vegetables and fruit at a discount to avoid trucking them back to the farm. 3. Go to a farm and buy direct. If you live close to an organic farm with a storefront, visit and buy from their bargain bin. Check with the grower to see what time they put out the bargain items. Often this is early in the morning, just after they open. 4. Buy fewer processed and packaged goods. It costs energy to process food so naturally, the cost of packaged goods is higher. Rather than buy pre-made pancake mix- make your own, the time difference is minimal. Replace store bought cookies with homemade. You can even make your own granola bars. The fewer pre-made goods you buy, the farther your food budget stretches. there should be asterisks on some of these. Those that live in ultra “urban” settings, like myself, can’t grow their own food, can’t find a farmers market nearby, or don’t own a car. We too do not have a plot for a garden but grow tomatoes, herbs and now green beans in pots. Herbs can often be grown inside too! Though there may be some cities that don’t yet have Farmers markets, they are becoming more common in urban areas. Hopefully your city will have one soon. Anyone with a 5 gallon bucket and a window can grow tomatoes.